Cooler Master refreshes its Hyper 212 lineup with two new models; the Black Edition and the RGB Black Edition. Both models promise easier installation than their predecessors thanks to a new Snap and Play mounting system, as well as an improved fan mounting bracket. The new Hyper 212 has a full-black aluminium heatsink with four direct-touch heatpipes. 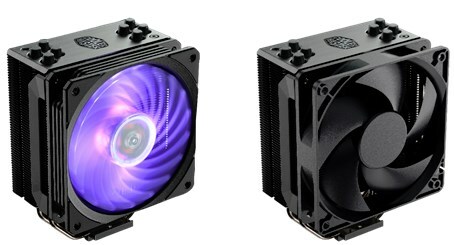 The Hyper 212 Black Edition features a 120mm Silencio fan with Silent Drive IC technology, while the Hyper 212 RGB Black Edition delivers fancy RGB LED effects with the SF120R RGB fan. The latter can be controlled via the included RGB controller, or via a motherboard's RGB header. Both models should be available soon. The regular Black Edition has a suggested retail price of 34.99EUR, while the RGB Black Edition should go for 44.99EUR.